I thought I'd have a bit of a break from blogging about mummy/Joey things and blog about one of my obsessions......ClaireaBella. If anybody reading this knows me personally or you follow me on Twitter then you will know how obsessed I am about the brand. The brand was created by a woman called Claire from Hull who at the time was working as a custody sergeant with the police and started creating bags for a few of her work colleagues and then they were seen on the likes of the Towie cast. Back when the brand was created Claire made every bag herself, nowadays because the brand has evolved so much a company called Toxic Fox now has artists that make the jute bags by hand. As you can see by the above photo the brand doesn't just sell bags, there are a wide range of products available such as phone cases, iPad cases, hoodies etc. I use my ClaireaBella stuff ALL the time, especially the bags whether I'm popping to the shops or on holiday I'm never without a form of ClaireaBella. 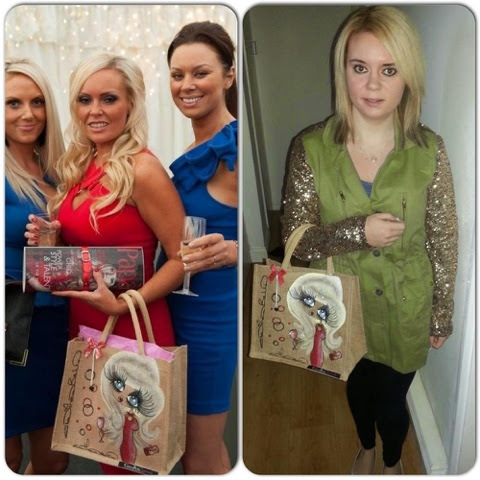 I first became aware of the ClaireaBella brand in 2011/2012 after seeing one of the Towie cast with a bag and fell in love immediately. I bought my first Large jute bag to take on my holiday to Turkey that year. From then on my obsession got bigger....and more expensive. 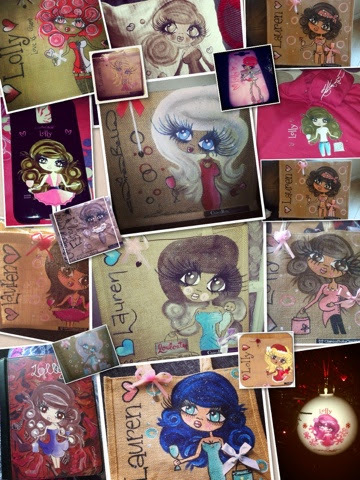 I have 3 limited editions which were my most expensive ClaireaBella purchases but overall I have about 13 bags now. 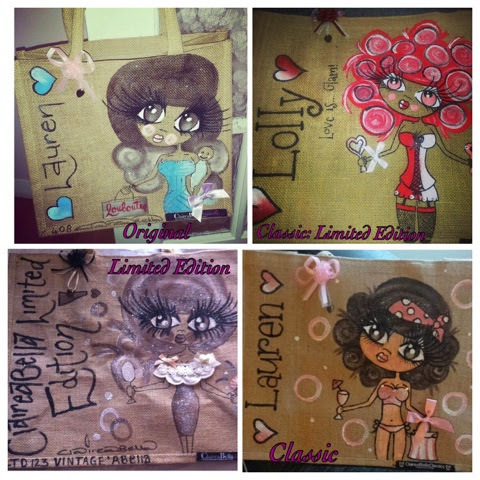 Before I go on I think it may be handy to explain the different variations of the jute bags; you have the Originals, Classics and Limited Editions. The originals are created by Claire herself and you can customise the bag to your own specifications, they come in 2 sizes Medium and Large and they are only available when Claire has the time to actually do them and there are always a very limited number. The classics are created by artists that Claire has trained at Toxic Fox and you can pick from a variety of hairstyles, hair colour, outfit, eye colour and skin colour. The classics are available in 3 sizes; Polo, medium and Large. Finally, the Limited Editions are bags that can be either created by Claire or the Toxic Fox artists. The limited editions you can purchase from Toxic Fox can be special occasion bags for example Christmas, Valentines or Mothers Day. Limited Editions that are done by Claire are usually based around a theme or colour and you can usually get yourself one on eBay or in a twitter competition Claire does now and again. In 2012 I was lucky enough to win a competition and I received a very special bag from Claire, she had won an award and made a special bag to take along with her. My favourite at the moment is my Original bag, after years of trying to get one I finally ordered mine on 12th June this year and there's quite a nice story attached....if you've read my previous blog posts you would know that I have recently had a baby well my due date was 11th June (I ended up going 8 days over) and Claire had announced that there were going to be a batch of originals available on that day. After stalking the website all day i actually managed to order one and seeing although I was waiting for the arrival of my little boy I thought it would be nice to add him to the bag as well as my love for Christian Louboutins. ClaireaBella is a great brand. No matter what your budget or style there is a ClaireaBella for you. 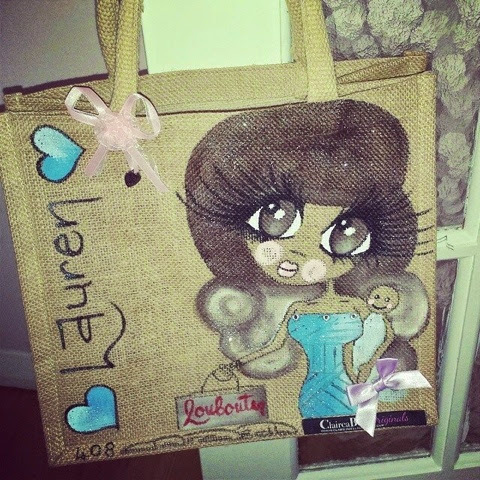 If you want to know more about ClaireaBella and it's products then visit the ToxicFox website or ClaireaBella Designs. Also keep an eye out on twitter and Facebook for competitions to get your hands on one.